Hot off the “Roaring Twenties” and headfirst into the uncertain volatility of the “Dirty Thirties,” criminal syndicates stormed into power by bootlegging alcohol during the Prohibition Era, but the most notorious “liquor” of all time is about to set off a violent chain reaction within the mafia underworld! 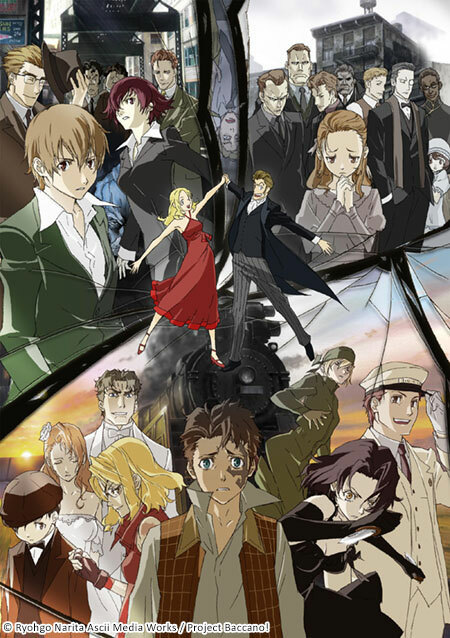 Each of the gritty stories in Baccano! involves an eclectic cast of innocent and not-so-innocent, turbulent characters in several unrelated plots intersecting and crossing each other as events spiral further and further out of control. Immortal alchemists, mafia-operated speakeasies, and many other elements of pulp fiction are brutally mashed together for a explosive massacre straight out of crime noir movies. After leaving their home in search of a new land, a group of alchemists are given by a demon…an “Elixir of Immortality”. Those who drank the elixir also gained a strange skill; they can “devour” each other with their right hand. A variety of people exist in the underground community: the young boy Firo, from the Martillo family, and family bookkeeper Maiza; the foolish thieves and lovers Isaac and Miria; the Gandor brothers, joint heads of the local mafia; the young thug Dallas and his sister Eve; and the alchemist Szilard, now over 200 years old, and his assistant Ennis. They have all lived their own lives, separate from one another… But when Szilard recreates the “Elixir of Immortality,” their lives begin intersecting as if led by fate. The transcontinental train, The Flying Pussyfoot, makes its way from Chicago to New York. Several passengers are aboard: Goose and Chane, from the revolutionary terrorist group; Jacuzzi, Nice and their gang; the hitman Ladd and his fiancée Lua; Senator Beriam’s wife and their daughter Mary; an immortal boy; a mysterious conductor and an informant… But it’s not only “humans” who are on this train. Could it be that the legendary Rail Tracer, rumored to erase passengers one by one as it moves from the back of the train to the front, may appear as well!? Total Run Timeapprox. 405 min. © Ryohgo Narita Ascii Media Works / Project Baccano!